When social services are involved with your children it is likely that your social worker has talked to you about issues such as the Child Protection Register, whether or not your child’s name is on the register, and also about Child Protection Agreements which you are required to keep to. If social services are involved it is also possible that you have found yourself in a position where your children are in foster care or living elsewhere, and your social worker has told you that social services are going to make an application to the court in respect of your children. Involvement with social services and your family can often be an emotive, distressing and confusing time. 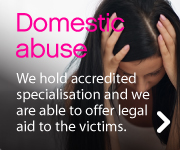 Here at DS Legal, our experienced legal team are trained in this complicated area of law and are able to deal with matters of this nature in a sensitive and caring way. It is always important that if social services are involved with your children, you seek legal advice as early as possible. This is your right, and we can help you with issues of contact, parental responsibility and residence. We can also advise you about the services that the law says your children may be entitled to. We have connections with local agencies and voluntary bodies who we can approach to give you assistance if this is required.